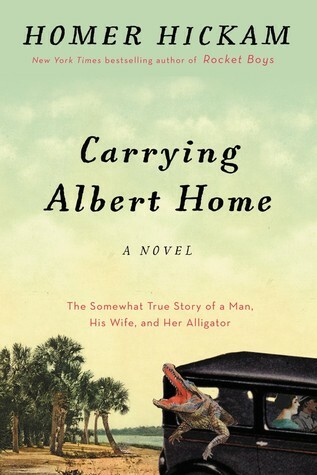 Review of ”Carrying Albert Home” by Homer Hickam | Lit.Wit.Wine & Dine. Many thanks to HarperCollins UK, HarperFiction for providing me with a free copy of this book in exchange for an honest review. Who couldn’t love a book about a coal miner, his want-to-be-anything-other-than-a-coal-miner’s-wife wife, her pet alligator, and a gratuitous rooster? Whimsical beginning with the Table of Contents, Carrying Albert Home is the story of how Elsie and Homer’s marriage is likely saved by a journey that turned out to be, well, kismet. Traveling through four states to return Albert the alligator (given to Elsie as a wedding present by her famous former boyfriend, Buddy Ebsen) back home to Orlando, the group have some pretty amazing adventures. Some are, shall we say, a stretch, but that’s the point. I love that this book details the (well-embellished, I’m sure) tales told to the author by his parents about their 1935 road trip. While I found that a couple of chapters were a bit too long, I really liked this book and could certainly see it turned into some sort of theatrical or film production.